In an ideal world, your sales quota is high enough to hit with a bit of effort but low enough that it is possible for a reasonably good salesperson to reach it. Unfortunately, the analysts who set that quota are sometimes off. Anything from an unexpected drop in the market to a bit of bad press about your company can put your sales quota out of reach. 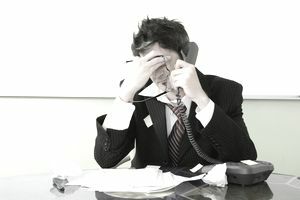 When your sales quota is set unmanageably high, you can take some steps to try to resolve the issue. What you can do depends largely on who sets that quota number, and how much leeway your immediate managers have when it comes to quotas and commissions. If your quota is set by your sales manager, you're in luck. You can talk directly to the responsible party and perhaps get some immediate relief. In a large company, however, your sales quotas are most likely set by someone in upper management. They'll often be determined on a company-wide level with adjustments based on region, area, and perhaps past sales performance at each location. In that case, you'll still need to start with your sales manager because going over his head will only cause bad feelings and a lot of future unpleasantness. The best way to approach your manager is to set up a quota intervention. Get everyone on the sales team together and schedule a meeting with the sales manager. Whatever the temptation, do not start playing the blame game or you will turn the situation into a “rep vs. manager” contest, which means that your manager is now your opponent. Obviously, he's not going to want to help you in this case! Think of it as a sales call on your manager — you're trying to sell him on your case, which is that your quota for the period is unrealistically high. Before you go into the meeting, pull together all the proof you can find — past performance numbers, evidence of sales-affecting issues such as that aforementioned market drop, descriptions of your sales activities and their results. Be as specific as possible. The idea is to show management everything you've done to achieve your goals, and that it simply wasn't possible. If you are trying to reach someone in upper management with your manager as the intermediary, draft a letter that summarizes your case and have everyone on the team sign it or otherwise indicate their support. Your manager can pass this letter up the ladder, along with the evidence you've collected. When the problem affecting your sales numbers is a temporary situation, it may not be worth storming upper management to try to get the quota changed, because even if you succeed it will take time for the company to adjust and distribute new quotas. But if the problem is an ongoing one, it may well be worth the effort to present your case.